Libra. © 2003 Torsten Bronger..
Libra (abbreviation: Lib), the Scales, is a faint southern constellation that is the seventh of the zodiac and the only one that is not named after a living thing. It lies between Virgo to the west and north and Ophiuchus to the east. Appropriate to its name, it once held the autumnal equinox (but no longer, thanks to precession). 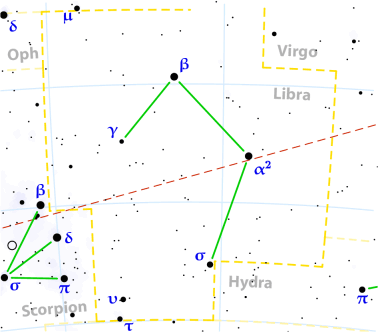 However, "Libra" is a more modern name, its two brightest stars once representing the outstretched claws of the Scorpion. See below for details of the constellation's brightest stars and interesting deep sky objects.